I’ve been so busy lately trying to stay healthy, happy, and motivated. I’m constantly on the move or thinking of what I’ll do next; I guess you can say I don’t like being bored. With a mindset like “go, go, go” it’s super important to keep your days organized. I’m guilty of slipping up, don’t get me wrong not everyday is perfect, but I find it’s easiest to navigate life when things are in order and where they need to be. So today, I wanted to focus on ways you can keep your daily routine in check and moving smoothly! I didn’t realize how useful this tool could be until I began using it. Set alarms for important times throughout the day. I use mine to obviously wake up in the morning but also for tracking my water intake, TV shows, and house duties. It makes me aware of how much time I’m actually spending on something or when I should stop/start a new task. I still use my regular paper planner but also love to include my top priority dates in my IPhone calendar. Making appointments for things has never been easier. I can literally whip out my phone and punch in a time right then and there. My phone works great for “in the moment” situations. Stop procrastinating. The top two ideas should help with this. Stay focused on what’s to come, which is accomplishing your daily activities and long term goals. Instead of lounging for an hour or two, try working out. If you’re not into that, read a book or learn a new skill. Time is limited so use it to its fullest potential. Everyday I try to do something I love and something that’s beneficial to my mind or body. Without my morning coffee, I just can’t function. Find something that gets you out of bed in the morning and going all day long. For me that’s caffeine, but it could be anything from a daily mantra, yoga, or preparing a healthy breakfast each morning. This will propel you to do great things throughout the day and insure you’re making the most of it. This is easiest done through color coding! Grab those highlighters (digitally too if you’d like) and start categorizing what is most important, important, and just needs to be done by the end of the day. Using this method of organization is a good reminder that you’re aware of your needs. Take some time to do this each morning! 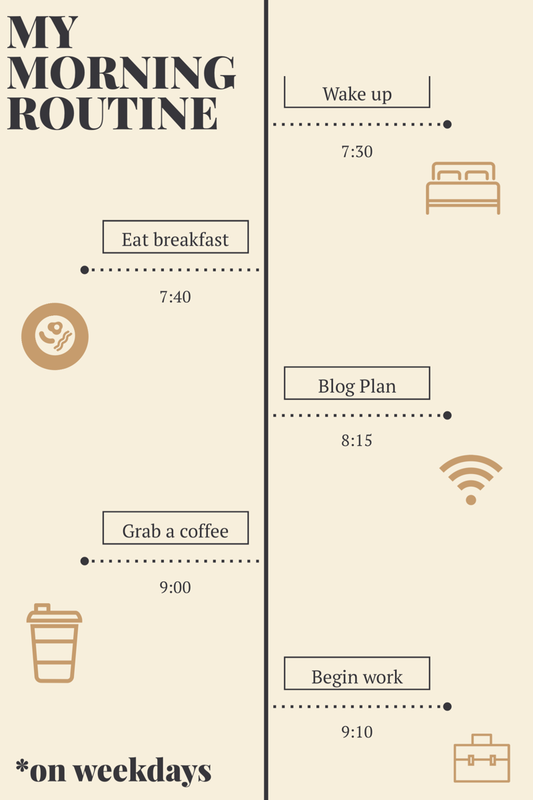 Do you have any secret tips to making your routines run smoothly? Do you already do one, or more of these things? How has it changed you? I wanna know in the comments! Let’s start a discussion on what works and maybe what doesn’t!